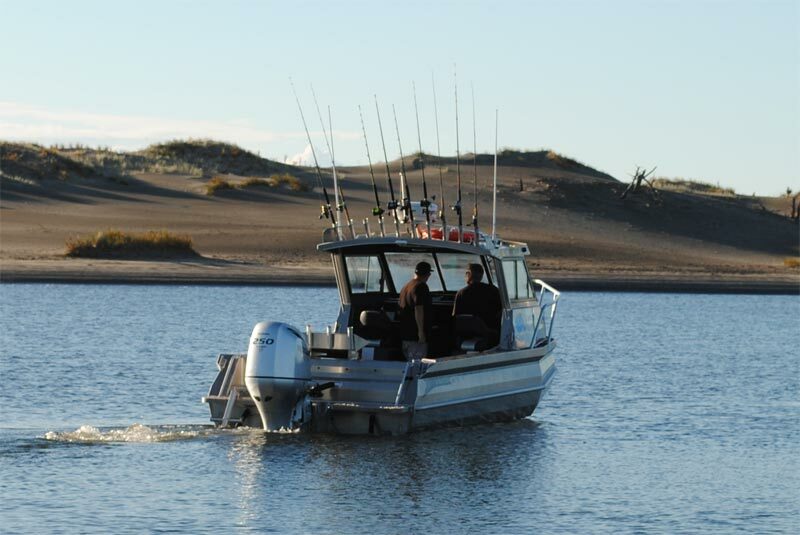 The boat we currently use is a Senator RH770 which is an 8-metre aluminium pontoon hardtop vessel. 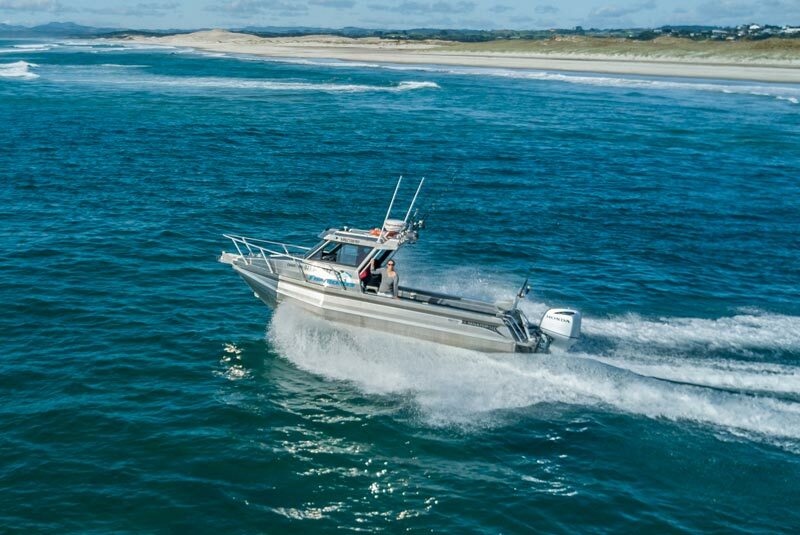 Senator is a leading and well established New Zealand boat builder based in Napier and the RH770 is a popular choice for rescue vessels. The pontoon design creates an inbuilt flotation device, meaning that this boat is virtually impossible to sink. 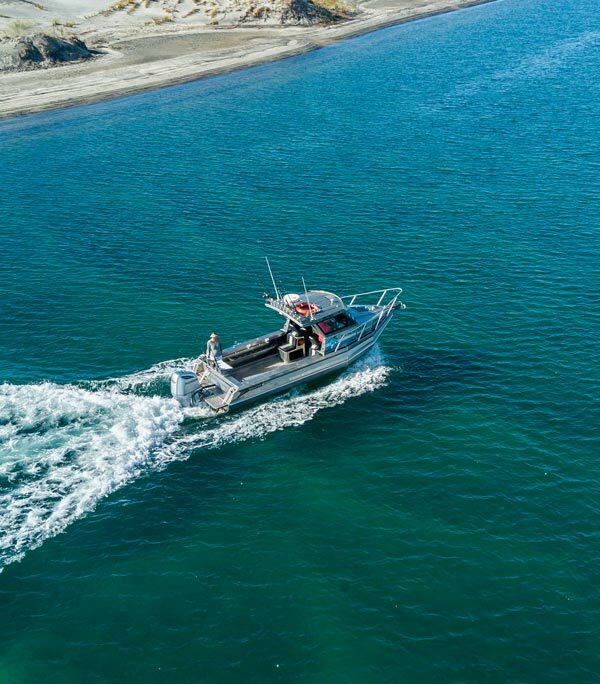 It is equipped with a 250HP Honda 4-stroke outboard motor which allows us to reach our destinations quickly – you’ll be surprised at how quiet it is! We recognise how important it is to get you where you want to go as quickly as possible, to allow you maximum time to enjoy the experience. In good weather, we can get you to any destination within 30 kilometres, in under 30 minutes. Fishmeister has been custom-designed by Mike, together with the Senator designer, for optimum fishing space. Unlike RH770’s you may have seen as rescue vessels, Fishmeister has a smaller cabin size to maximise the fishing platform. While there is an on-board toilet and comfortable cabin space, our boating experience is all about the outdoors. 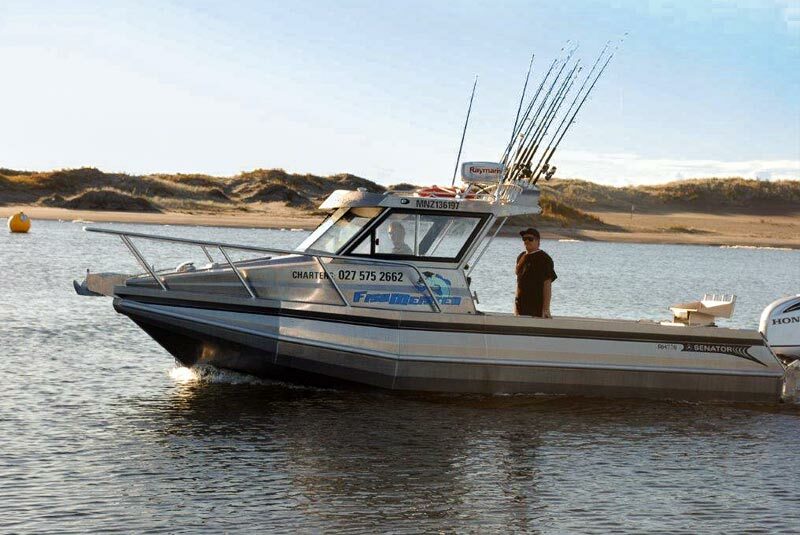 We can comfortably accommodate six active fishermen at any one time. We also have a large live-bait tank on board that can easily accommodate large kahawai. Fishmeister is fitted with a 2 kilowatt Chirp transducer & sonar module that enables us to locate fish at depth, while travelling at speed. Our Raymarine radar “bird mode” allows us to pick up bird workups many kilometres away – perfect for those fish boil ups.